Mkay have you heard of the Fit2Fat2Fit guy??? FABULOUS! Personal Trainer, Drew Manning, was in SUPREME shape. He decided to embark upon a journey to understand his clients more. He spent 6 months, letting himself GO! Didn't work out. Ate like CRAPOLA. Gained a TON of weight. Lost his 6 pack COMPLETELY. Then he spent 6 months getting back in shape. It worked. It was hard, but it worked. I think that/he is AMAZING! and INSPIRING! Brown the ground turkey. Drain off the fat (mine didn't have much fat left so I left it in there because I was omitting the oil from the sauce portion). Add garlic, ginger, green pepper and red pepper flakes. Cook until green peppers are soft. Put the cilantro into a food chopper (I leave the stems... easier that way) with the lime juice. Pulverize the CRUD of it. Whisk peanut butter, soy sauce and cilantro/lime mix together. Add this sauce to the meat mixture. Stir it up to incorporate and then remove from the heat and let it cool down a bit. 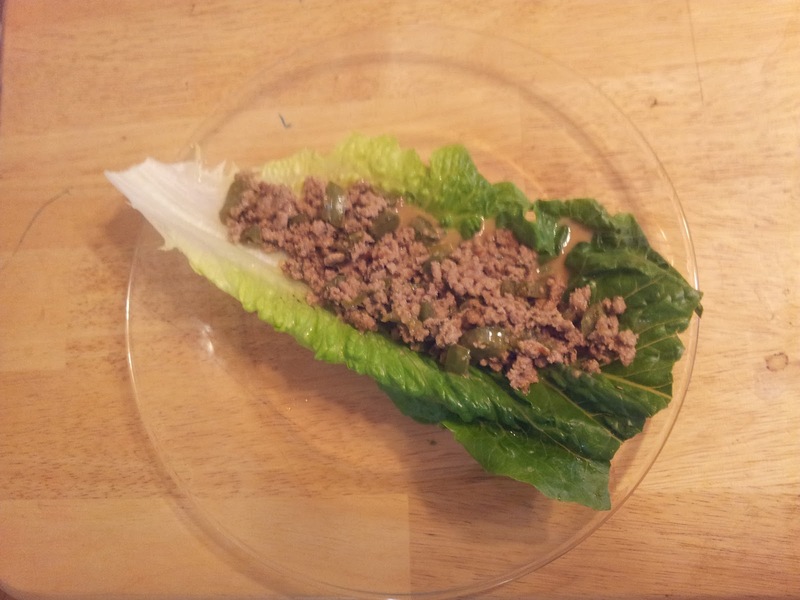 Spoon the meat mixture into the lettuce leave and pull up the sides of the lettuce like a taco and ENJOY! So good you won't believe it is healthy!! !